Hovering slowly and precisely along the taxiway I couldn’t help but be reminded of the time I flew a Harrier T.Mk10. 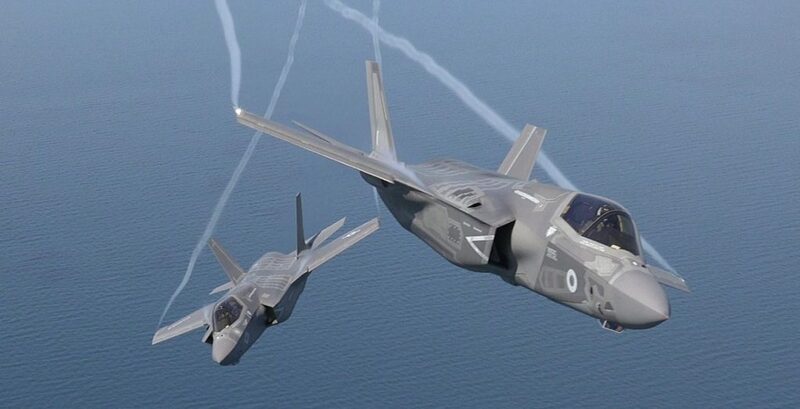 I’d thought that the Harrier was an incredible flying machine, but the F-35 is something else! In fact, as soon as I sat down onto the Martin-Baker Mk16 ejection seat it was immediately apparent that the F-35’s cockpit is unlike that of any other fighter I’ve flown. Of course, I should qualify that observation by making it clear that although I’ve been lucky enough to fly about a dozen different fighters and fighter trainers, powered by piston, turboprop and jet-engines, I am not a fighter pilot. However, when the opportunity arose to sample the Lockheed Martin F-35 simulator I seized at the chance. Not only will the F-35 eventually replace a significant percentage of the western world’s tactical aircraft, and will certainly be flying well into the second half of the 21st Century, but some of the incredible systems incorporated in the F-35 will also eventually filter down to airliners and business aircraft (for example, the 787 and many bizjets now have HUDs). More than that though, it may well be the last ever manned fighter. Not surprisingly, this very advanced aircraft relies on an incredible amount of software, with over eight million source lines of code. This is four times the amount used for the world’s first fifth-generation fighter, the F-22 Raptor, and reflects just how powerful the F-35’s systems and sensors are. They include an active electronically scanned array radar (AESA), an electro-optical distributed aperture system (DAS) and an electro-optical targeting system (EOTS). For me at least, the most amazing of these is the DAS, as the six sensors give a pilot 360° spherical day/night vision. Consequently, if the pilot looks down in the cockpit, they ‘see’ what is underneath the aircraft in their helmet display! Before sampling the simulator I took a leisurely walk round the full-scale mock-up. At 15.4m in length and with a wingspan of 10.7m it’s not as big as some fighters, but is quite tall at 4.3m. In some respects it’s not entirely dissimilar to a scaled down, single-engine F-22, although in others it’s radically different. One of the first things I notice is that although there are hardpoints on the wings there are no pylons, as all the weapons are carried internally. This keeps the radar signature down, ensuring the aircraft is very stealthy. 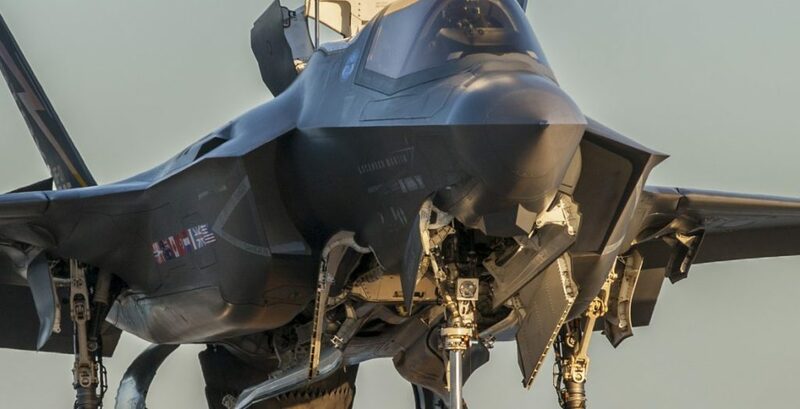 The wings, tail and undercarriage all look essentially conventional, although I know that the propulsion system on the F-35B variant is most unconventional. The engine is the Pratt & Whitney F135, the most powerful jet engine ever made for a fighter. Additionally, the STOVL B-model being built for the US Marine Corps and the Royal Air Force and Royal Navy and which we are flying today incorporates the Rolls-Royce LiftSystem, and this combination enables the aircraft to make a very short takeoff, fly supersonic and then land vertically. I may well run out of superlatives before I finish this article, but the motor really is a mechanical marvel, as is the remarkable LiftSystem. The F135 is a more powerful derivative of the Pratt & Whitney F119 engine, as used on the twin-engine F-22 Raptor. It can produce up to 28,000lb (124.5kN) of dry thrust and an incredible 43,000lb (193kN) with afterburner. An interesting facet is that the engine’s two spools contra-rotate, which helps to shape the direction of core airflow as it transitions between the high-pressure turbine (HPT) and low-pressure turbine (LPT), improving the efficiency of the engine and possibly reducing the number of rows of static stators and vanes. The LPT also turns the driveshaft which powers the Rolls-Royce LiftFan located behind the cockpit and ahead of the engine. This is a horizontally-mounted unit consisting of two contra-rotating fans, one directly above the other behind the cockpit and covered by a large door, which is only opened when the F-35B is hovering, performing a short takeoff or transitioning between horizontal and vertical flight. Each fan is driven by a separate bevel gear system contained in a common gearbox and powered by a driveshaft which runs along the aircraft’s longitudinal axis. In the hover the driveshaft delivers 28,000shp to the LiftFan’s clutch-and-bevel-gear system so that the LiftFan provides downward thrust as a column of cool air, along with a pillar of hot gas from the engine’s tailpipe, known as the Three-Bearing Swivel Module, or 3BSM. This remarkable piece of equipment consists of three articulated sections of titanium nozzle casing, with each section connected to the others and driven by its own ring bearing which can direct air through a 95-degree range from five degrees forward to horizontally aft. Interestingly the ring bearing actuators for the 3BSM are powered by ‘fueldraulics’, as some of the aircraft’s fuel is pressurised to 3,500psi and functions as hydraulic fluid to power the servo-valve actuators. The 3BSM can swivel fully from horizontal to vertical in 2.5 seconds, completely redirecting all the thrust downwards. 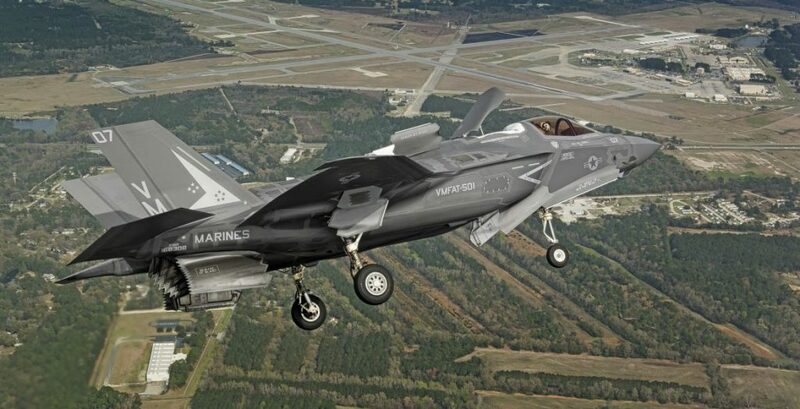 Together with the downward thrust produced by the LiftFan and the two wing-positioned roll-posts the F-35B can turn 15,700lb of horizontally directed thrust into 39,000lb of thrust directed vertically downward – in less than three seconds! As a hover demands very high power behind the LiftFan’s big inlet door are a pair of auxiliary air inlet doors (AAIDs) which provide additional air for the engine. Below the LiftFan, the variable area vane box (VAVB) directs the cool air driven downwards vertically by the LiftFan. The VAVB’s aluminium louvered doors can be angled all the way from 45 degrees back, through fully vertical to five degrees. Finally, the roll-posts are variable-area nozzles underneath each wing which provide roll control in hover mode by directing bypass air from the engine through a pair of flap-type titanium doors. I sit down in the cockpit under the watchful eyes of – unlikely as it may seem – Kenn and Barbie. Kenn Copler and ex-F-18 driver Craig Dalle (callsign ‘Barbie’) know the systems inside out and back-to-front, so I’m in good hands. The first thing that strikes me is just how clean the cockpit and panel are. There are very few switches, knobs and levers, and even controls you’d think vital for a STOVL aircraft, such as nozzle and flap selectors are conspicuous by their absence. All you really have are the engine start switches, undercarriage lever, emergency jettison button, landing lights, park brake and that’s pretty well it. Everything else is controlled either via the touchscreens or by voice control. 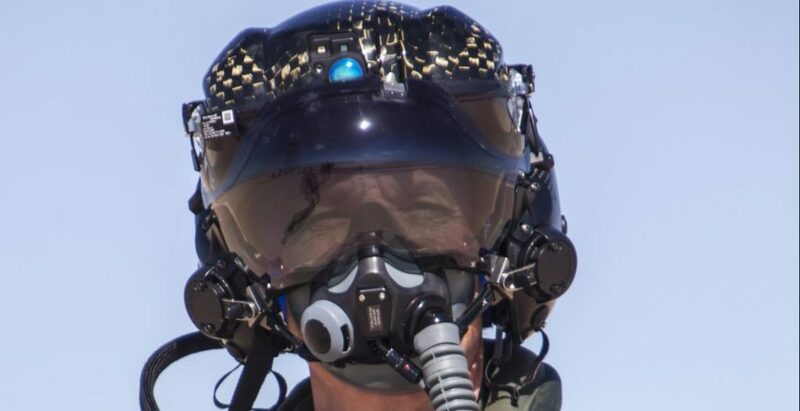 Another item missing is the HUD – F-35 pilots are presented with a truly phenomenal amount of information, much of which is displayed in their helmet visors. In fact, and unsurprisingly, this aircraft’s ancillaries (such as the ejection seat and pilot’s helmet) are just as sophisticated as the aircraft itself. The cockpit is dominated by an L-3 panoramic cockpit display (PCD) with touchscreen control and active matrix liquid crystal displays. The PCD features dual 250 x 200mm screens on either side of a centrally located 500 x 200mm display. The big screen has a 2560 x 1024 pixel display while the smaller two are 1280 x 1024. They’re extremely clear and easy to read. The upper part of the large screen is primarily for sub-system information, such as engine gauges, fuel quantity and undercarriage status, caution and warning systems, plus autopilot/ auto throttle and navigation information, and lots more. Tactical information is displayed on the lower part of the screen and is split into four segments called portals. The pilot can place anything anywhere and even change the size of the portals. Symbology at the bottom left of the display on the F-35B’s PCD shows the status of the 3BSM and LiftFan. In the centre of the console is a battery-powered standby flight display. 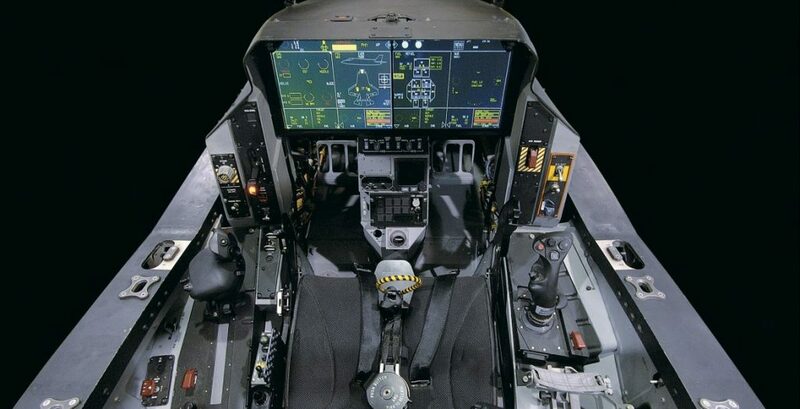 However, most of the information is displayed within the pilot’s visor, while situational awareness is enhanced by a voice command system that issues directional threat warning messages. On the right side of the cockpit is the sidestick, which as well as operating the ailerons and elevator conventionally also enables the pilot of the STOVL variant to hover the aeroplane. The throttle is on the left and moves through a linear slide rather than a rotary arc. Both sidestick and throttle are liberally studded with switches and buttons and the HOTAS switchology is pretty complex, although interestingly there isn’t a trim button. Starting the engine is easy – just turn on the IPP (a sort of APU) then set the engine switch to run and it, well, runs. Taxi is very straightforward, the nosewheel steers through the rudder and for tighter turns you can adjust the steering gain. The field of view out of the forward hinged canopy is good, although as long as the DAS is functioning correctly the windscreen could be opaque. Out on the runway of the synthetic Nellis AFB I run through the pre-takeoff checks and search in vain for the flap selector, until Barbie reminds me that the flaps are purely automatic. Takeoff is simple – line up, full ‘dry’ power then into afterburner. The acceleration is phenomenal, rotate at 150kt after a very brief ground roll then retract the undercarriage as quickly as possible! The speed just keeps building and in no time I’m flashing across the virtual desert at M0.9 and 100ft – what a rush it would be to do this for real! Clever symbology shows when your vector will coincide with the ground. I can scarcely believe it’s possible but do as I’m told – and it works as advertised. The power and control available is incredible, yet despite everything the Lightning is just so easy to fly. The roll rate is pretty rapid, but the overwhelming characteristic is just how precise control feels around all three axes. As I’m more interested in flying than fighting in the sim I don’t have time to examine the myriad weapons available, but can’t resist dropping a pair of 2,000 pounders on an enemy building. As with every other aspect of the F-35 (with the possible exception of the HOTAS, which clearly takes some learning) target cueing, aiming and bomb release are all perfectly straightforward. I don’t miss. Heading back to the virtual Nellis at M0.9 takes no time at all, but as the field comes into view I realise that although the throttle’s a long way back the F-35 isn’t decelerating as much as I’d expected. Sensing my surprise Barbie explains that “it really doesn’t like to slow down” so I thumb the airbrakes out to help get the speed below the 300kt VLO. Having selected the undercarriage down I instinctively look for the flap lever, then remember there isn’t one! As Nellis has an elevation of about 1900ft I disregard the altimeter and use the RadAlt instead. Having flown a reasonable circuit with the throttle in manual and a Vref of 150kt to a ‘touch and go’ I turn downwind at 250kt, re-select ‘gear down’, punch the ‘convert’ button and turn back towards the runway. (You can press the ‘convert’ button at any speed, but the computer simply won’t engage the LiftFan above 250.) Symbols on the PCD show that the F-35 is ready to hover, so I simply press the speed command button on the throttle ‘in’. Speed is now controlled by clicking the speed command button up and down to change the selected speed in the command box and you simply ignore the throttle and just use the stick – push forward for down, back for up, left to go left and right to go right. It really is that simple. Barbie recommends using 60 initially, and then slowly reducing as the runway’s threshold is approached. He also gently reminds me to stay off the rudder, unless I want to make a ‘pedal turn’. Once over the runway numbers I set ‘zero’ in the speed command box. Although its been about 15 years, I vividly remember that as the Harrier transitioned to purely jet-borne flight it all felt a little ‘knife-edge’ as our jet fighter slowed to a stop in the sky, somewhat improbably poised on four columns of screeching, scorching air. I was very aware that the Harrier has divergent directional stability if an intake is blanked by yaw while in the hover, and also in the low speed range when transitioning to and from wing-borne flight. In fact, this situation is so serious (it’s a sort of aerial ground loop that almost always ends with a fatal accident) that Harriers are fitted with a device that senses if yaw is starting to develop and shakes the relevant rudder pedal as a cue for the pilot. The Harrier was a product of a very different technological time – and only the very best pilots were streamed onto Harriers. Well, the F-35 is nothing like that. There’s no issues with divergent directional stability or a pedal shaker. In fact it really does seem extremely easy to fly. Of course, having never flown a real F-35 I can’t comment on the fidelity of the simulator, but even if a real one is two or even three times harder than the sim, it’s still clearly pretty straightforward to fly – which is how it should be. Indeed, along with all the other tasks that a 21st century fighter pilot must perform, simply flying the aircraft is probably the easiest bit! In fact the F-35 felt rock-solid and very stable as I gently eased the stick forward and gently sank onto the runway. Emboldened by my success I fly a STOL takeoff (full afterburner, stick back at 60) then return for some more advanced hovering, including some brisk pedal turns, before descending to 20ft and hovering along the myriad taxiways at 10kt. I doubt you’d do this in real life as it wouldn’t do the tarmac any favours at all (I saw a real F-35 hover at Farnborough the next day, and the energy being directed downwards was extraordinary), but it is good fun, while looking straight down through the floor at what is underneath the aircraft is simply surreal. As an experiment I push the stick forward sharply to try and produce a heavy landing, but the computer simply won’t allow touchdowns with a sink rate above 750ft/min. As the fuel state is now quite low I try a vertical takeoff and quickly pull the stick back – it goes up like a rocket-powered lift. One more vertical landing and it’s irrefutable – Lockheed Martin has done an amazing job in making an incredibly complex aircraft remarkably uncomplicated. But what a machine! STOVL, stealthy and supersonic, its fused sensor system and stealth design means the F-35B pilot sees everything, but no one sees the F-35. To paraphrase (I think) Abraham Lincoln, if you’re the sort of fighter pilot that likes this sort of thing, then this is very much the sort of thing that you’ll like! This article originally appeared in the January-February 2017 edition of Australian Aviation magazine. The last ever unmanned fighter eh, I doubt it. Technology hasn`t yet got to the point of eradicating the pilot from the cockpit. It seems that history is repeating from the fifties when manned aircraft were going to be superseded by missiles and unmanned fighters. Here we are a half century later and we still have humans in the cockpit. Can you perform maneuvers that would be considered ‘bad’ by the computer? Is the computer limiting your potential movements sub-optimal in a jet fighter? Obviously you dont want to make a hard landing or a stall – but maybe they’d be necessary at points? I’m just worried about all those lines of software codes!! Throw in a couple more good measure!! I couldn’t resist commenting. Veryy well written!